Old Navy's Superfan Nation Collection: 32 NFL Teams. Tons of Colleges. All Better Than Chest Paint. Still deciding whether you should flash your fandom with a logo'd cotton tee or a chest-covering tattoo? 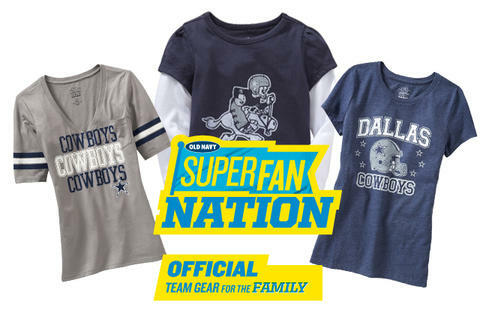 Let Old Navy sway you toward sanity with their Superfan Nation collection -- all of which you can win by emailing the name of your favorite team here: superfangiveaway@oco.com. Once you've emailed in your most beloved squad, check out gear from all 32 NFL teams -- and an abundance of colleges -- covering everything from socks, to hats, to signature fleeces (finally a way to get a sports fleece without that pesky magazine subscription). Better yet, the threads start at just $14, so you can rock your new lucky hoodie and still have money to populate what you're lovingly calling "Bobblehead City". Scoop up your local teams' gear at your nearby Old Navy shop, or shop online if you happen to live in Dallas, but want an Eagles shirt -- and have no desire to retain any of your friends. You can never have enough team clothes -- and you can definitely have enough laser tattoo removal -- so email superfangiveaway@oco.com for your shot to win Old Navy Superfan Nation gear. * By emailing us your favorite team before 11:59pmET on September 14, 2011, you will be entered into a random drawing through which three winners will be selected on September 15, 2011. Each winner will receive a $100 Old Navy gift card to purchase Superfan Nation gear of their liking, at their local Old Navy or at OldNavy.com. Winners will receive notification via email.